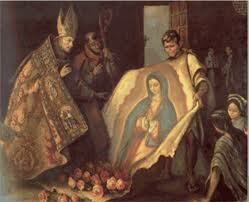 A feast day especially dear to us in the Americas is that of Our Lady of Guadalupe on December 12. On a cold December morning in 1531, the poor peasant Juan Diego was hurrying from his home near what is now Mexico City to attend Mass in a neighboring village. He was stopped in his journey by heavenly music and then the voice of a young woman speaking to him from Tepeyac hill. 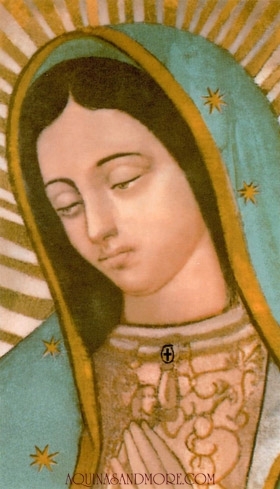 She identified herself as the all holy virgin Mother of God, and asked Juan to request from the Bishop that a shrine be built in her honor on the hill of Tepeyac. The bishop, although a holy man himself had doubts about the story of the middle aged peasant who spoke to him, and asked for a sign to prove that it was really the Mother of God who made this request. 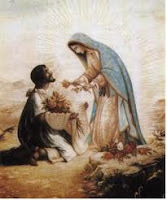 When Juan Diego returned to the hill a few days later, and repeated the Bishop’s request for a sign, the Lady told him to pick the beautiful Castilian roses from the top of the hill and take them to the Bishop. Collecting them in his tilma, he returned to the Lady who rearranged them to her satisfaction and told Juan to present them to the Bishop for her. Since this was the coldest part of winter and no flowers could possibly have been growing there, surely the Bishop would admit that they were miraculous. 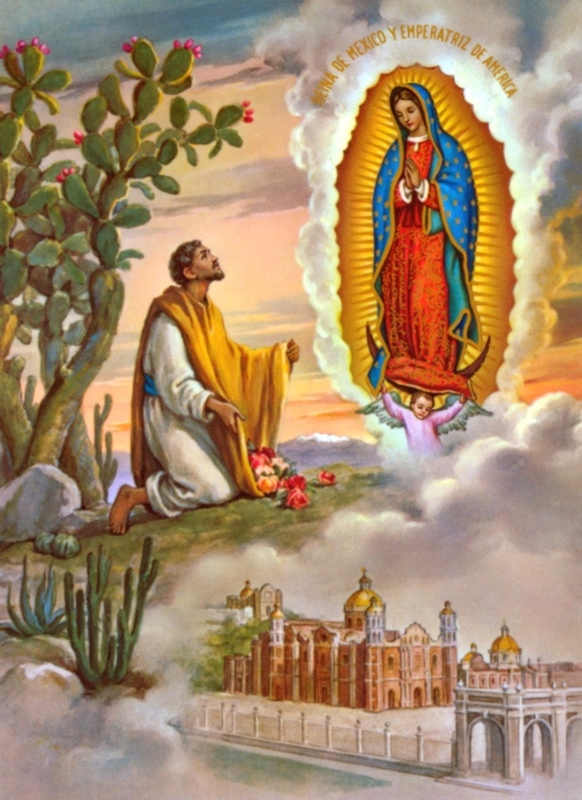 However when Juan Diego unfolded his tilma in the presence of the Bishop, and the roses fell to the ground, the image of Mary Mother of God was imprinted on the cloth and it was evident that this miracle was greater than that of the roses. Eventually the shrine was built as Our Lady had asked and this became the renowned shrine of Our Lady of Guadalupe in Mexico City. 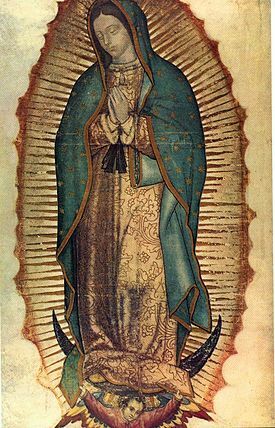 The devotion spread from the Mexican people to those of the United States and she is well known to all in our country and loved as our own American patroness. The black ribbon that Mary wears around her waist in the image is the Aztec maternity belt which shows that she is pregnant. For this reason, besides being Patroness of the Americas, she has become the Protectress of unborn children, and of the Pro Life movement. Mary told us through Juan Diego that she is our Mother and that she holds us in the folding of her arms. By turning to her and trusting in her help, we can, without fear or worry, face the difficult issues in each of our lives. She is eager to pour out many blessings on us and just wants us to come to her and ask.